Susan Elizabeth Hale M.A. circles the Earth with song teaching others to find and free their natural voices. She is creator of Earth Day-Sing for the Trees. Since 2010 over 10,000 people in 45 countries have participated in this annual global event. 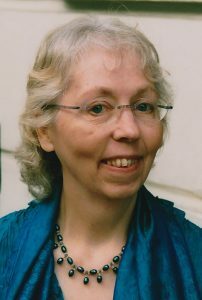 Susan is the author of Sacred Space Sacred Sound: The Acoustic Mysteries of Holy Places (Quest Books, 2007). American born, she now lives in the Malvern hills UK with her husband. Emma Oliver and the Song of Creation is her first juvenile fiction novel. Travelling inspires me because it helps me to be in the moment and see things I’ve never seen before. I always keep a journal handy when I travel. Being in nature helps me quiet my thoughts so I can allow something deeper to be heard. When I am working on a book I read the chapter I am working on before I go to bed and often wake up in the morning with an idea. My writing process is very old-fashioned. I write first with a pen and white paper. I read everything out loud to hear how the sounds flow together and make corrections as I read. Before I go to sleep I read what I have written that day. When I wake up I read it again. I continue to make corrections. When I’ve finished a chapter I type it onto the computer. When I’m writing dialogue I am both listening to and talking to my characters. I see my characters in my mind’s eye. Sometimes when I’m stuck I ask them questions. When I’m deep in my writing process, I will often hear one of my characters speak just as I’m beginning to wake up. I always have paper and a pen by my nightstand. I have been lucky to be in the right place at the right time to find people that led to the publishing of my books. I went to a writer’s conference and many of the presenters advised going through a tradional publisher first before trying to self-publish. I think readers will always prefer to have a book to hold and read in their hands rather than reading from a screen.